I am a professional. If a patient says something funny, maybe even ridiculous, I just stand there like one of the Queen’s Guards (minus the enormous black fur hat). Well, maybe I’m not completely emotionless, but I refrain from laughing—even if it’s totally justified. I would like to share with you some of the memorable statements. Not just for your entertainment, but to shed some light on some common misunderstandings. When discussing what a patient has already done, I have heard interesting references to one’s primary care physician in comparison to me. How about this one: “When I saw my regular doctor…” or “my normal doctor.” REGULAR? Hopefully they are not referring to bowel habits. Normal? No comment! Each person that made such a statement knows that I am a doctor, but may not understand how each type of doctor differs? Chiropractors are doctors. We are not medical doctors who learned to adjust the spine as a specialty, but are doctors of chiropractic (D.C). It is taught specifically in chiropractic colleges/universities (not in medical schools). Chiropractors are licensed by the state and federal government as one of the three types of physicians (chiropractic, medical, and osteopathic). There is also a separate state licensing board comprised of doctors of chiropractic who were appointed by the governor. 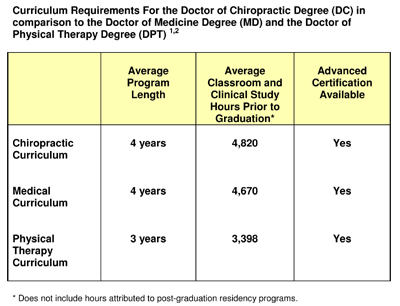 The extent of the chiropractic education is on par with that of a medical doctor. We are trained in primary care and are the third largest primary care health profession in the U.S. (after medical physicians and dentists). Our primary care training is not to prepare us for days of lancing boils or listening to hearts beat, but to enable us to determine if we can help or if a referral is needed and to whom. This demands knowledge of all of the body’s systems and pathologies. The below chart provides a comparison of educational requirements following undergraduate studies. 1- Meeker W, Haldeman H. Chiropractic: A Profession at the Crossroads of Mainstream and Alternative Medicine. Annals of Internal Medicine 2002, Vol 136, No 3. This next question makes me want to respond like a stand-up comedian: “Do you get adjusted by a chiropractor as well?” I once answered by telling a woman (who already displayed having a robust sense of humor): “No, I would never let one of them touch me!” She knew I was NOT serious since I couldn’t maintain a straight face. Patch Adams was right about using laughter as a healing tool, when appropriate. I have been receiving regular chiropractic wellness care and have embraced the natural chiropractic lifestyle my entire life. Being born into a chiropractic family has been a blessing for me on personal level (and ultimately professional). Why do I seek chiropractic wellness care when I am pain-free? The nervous system has a close relationship with the bones of the spinal column. The health and alignment of the spine is vital for the health of the nervous system and all the vital systems it controls. For this reason, I will continue to receive spinal checkups. I am also attracted to the natural lifestyle sewn into the chiropractic fabric (which includes diet, rest, exercise, mental attitude and proper nerve function). The particular woman mentioned above was not yet educated on the inner workings of her body and the role chiropractic plays in overall health and wellbeing. She was really asking if I ever had back pain. Once she understood the big picture of health, she realized why her question was initially amusing to me. 1. Journal of Occupational and Environmental Medicine March 14, 2011; Vol.